The LIVESTRONG Austin Marathon will be coming through the neighborhood Sunday morning, February 17, 2012. Race organizers are projecting 20,000 runners (includes the half-marathoners) and 30,000 spectators for the race that starts and ends downtown. Road closures will begin at 6:00 a.m. Start time of the race is 7:00 a.m. Cross traffic will be allowed to cross the route at certain intersections staffed by APD officers. You will find a map of the course here. 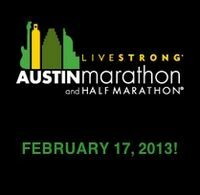 Runners will be coming north on Bull Creek to Hancock, north on Shoal Creek, left on White Rock over to Great Northern. Foster lane is mile 18 in the race. From Foster, they head east along Northcross Drive. You can expect to see the first runners coming through Allandale at 45th and Bull Creek around 8:00 a.m. Most of the runners will be through Allandale by 1:30 p.m.
On the route, the northbound lane on Shoal Creek from Hancock to White Rock will be open. White Rock will be closed completely until noon; Great Northern as well. According to the road closure sheet, one eastbound and one westbound lane on Foster from Great Northern to Shoal Creek will be open during the race (really?). The easiest way out of the neighborhood will be to get to Burnet Rd. Going north on Burnet Road will be interrupted at Northcross Dr./St. Joseph. Police will be at that intersection and letting traffic through as gaps in the runners allow. If you go south on Burnet Rd, go to 45th, take 45th east to Lamar. You will be able to get to Mopac from Lamar by heading south and turning right on to Westover. The longest wait times will be between 9:00 a.m. And 11:00 a.m. Plan ahead. Here is a link to the Road Closures sheet. You can also go to the race website for more information: youraustinmarathon.com.